As of 11 pm, the center of Hurricane Florence is located approximately 45 miles south of Emerald Isle. The Category 2 storm currently has maximum winds of 90 mph and is moving west-northwest at 6 mph. Emerald Isle has experienced hurricane-force wind gusts for the past 4 hours, along with heavy rain bands. The highest wind gust recorded at Fire Station 1 thus far is 81 mph. Emerald Isle has received approximately 6 inches of rain thus far from Florence. 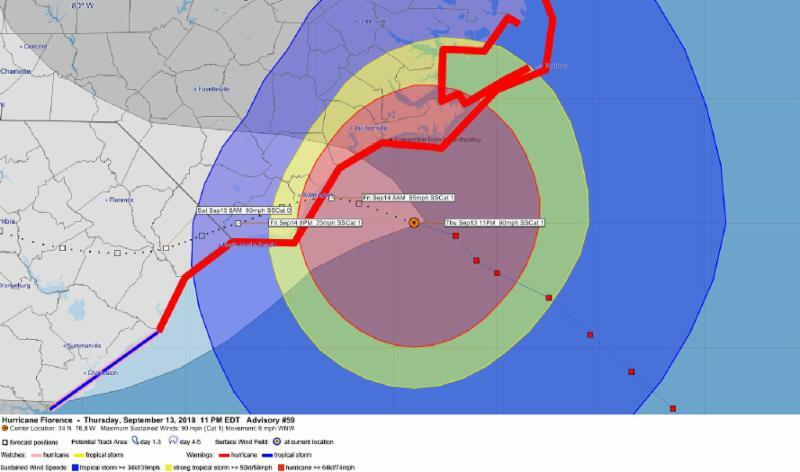 Florence is now forecast to make landfall near Wrightsville Beach tomorrow morning around 10 am with winds of 85 mph. The eye of Florence should make its closest pass to Emerald Isle at around 2 am, coming within 40 miles of Emerald Isle. Hurricane force winds are expected to continue all night, and begin to decrease late Friday morning. As of 8 pm, damage in Emerald Isle was relatively minor, with minor shingle and vinyl siding damage observed, along with several downed trees. However, the highest winds began around that time, and it has not been possible to make good observations in the darkness. Town personnel will provide a preliminary update on damage on Friday morning as conditions permit. Power is believed to be out everywhere in Emerald Isle due to Hurricane Florence, and there are now approximately 40,000 customers of Carteret-Craven Electric Cooperative (CCEC) without power. To view a real-time map of power outages in the CCEC service area, please visit http://outage.carteretcraven.coop/ . Emerald Isle remains under a Town-wide curfew, and the Emerald Isle bridge remains closed. No one will be allowed to enter Emerald Isle until further notice. The curfew will remain in effect for the duration of Hurricane Florence, until further notice. During the curfew, it is illegal for anyone to leave their own property and travel anywhere within Emerald Isle. make decisions based on public safety. Because Florence is expected to continue to impact Emerald Isle all day Friday and into Saturday, it is likely that the bridge will remain closed and the curfew will remain in effect until at least Saturday, if not longer. The curfew will be lifted and the bridge will be reopened only when Town officials have determined that it is safe for property owners, residents, and the general public to enter the Town. This information will be disseminated on the Town's various digital platforms listed below when these decisions have been made. All Town facilities are closed until further notice. Police, Fire, and EMS services will continue to be provided as long as they can respond safely, however, individuals remaining in Emerald Isle must realize that emergency personnel may not respond during the height of the storm's impacts or if damage makes it impossible for them to reach you.